I'm very excited to announce that I've teamed up with the most famous Irish brand and Ireland's top attraction, Guinness Storehouse for the Liberties Festival. The Liberties festival is one of Ireland’s oldest and longest running festivals and will take place from the 15th to the 22nd of July 2017 with a series of family-friendly, sporting and community events celebrating one of Dublin's most historic neighbourhoods. 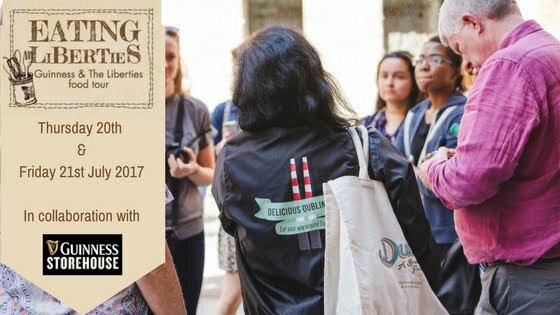 I have designed an exclusive 'Guinness & the Liberties food tour' through my Delicious Dublin Tours especially for the festival. I will be running these tours on Thursday 20th of July and Friday 21st of July, starting at 11am. We will visit some local food businesses, hear their stories, sample delicious food and learn some facts about Guinness and the Liberties during this 3 hour walking food tour. The tour will start at the entrance of Guinness Storehouse, we will visit four local food businesses and end with a Guinness and food pairing back at Guinness Storehouse. Advance booking is required and tickets are priced at just €5 each, thanks to Guinness Storehouse who are kindly supporting the event. Tickets can be booked via the Liberties' festival's website. Book fast as tickets are limited.